The sun managed to shine a few beams down this past week. Such a welcome sight considering that the snowman we built early last December still has not completely melted! It's been a long winter here and we are ready for some warmer, spring weather. Pretty soon those spring garden flowers will add color to the landscape, spreading cheer and happiness. 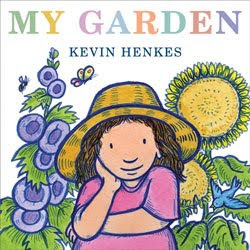 We had a head start on the season with a brand new spring garden themed picture book, just released this week by Wisconsin author Kevin Henkes. Mary, Mary, quite contrary, move over. There's a new girl in the garden -- a happy, little daydreamer who envisions chocolate rabbits, jelly bean bushes and seashell fields. Kevin Henkes sows the seeds of imagination and illustrates with colors of spring in his newest picture book, My Garden . A barefoot little girl helps her mother in a cheery garden by watering and weeding the plants. All the while, she fantasies about her ideal garden. "In my garden, the flowers could change color just by my thinking about it -- pink, blue, green purple. Even patterns." 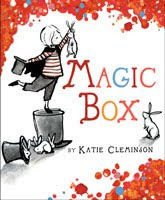 The little girl's vast imagination takes readers beyond the restraints of the world, into a extraordinary place where the flowers never die and where umbrellas conveniently pop out of the ground just as the spring rain begins. Kevin Henkes adds another feather to his brimming hat with this beautiful book. His spectacular, watercolor illustrations overflow the pages with creative page layout. Fanciful images appear as full bleeds and then he takes readers back to reality with smaller spot illustrations. His book presents endless possibilities as a read aloud and spurs the imagination. When I finished reading My Garden to my daughter, I asked her what her garden would contain. First she would grow all the toys she wants so that she wouldn't have to visit the store. Her plants would keep growing even in the snow. The garden would be filled with kittens, puppies, and balloons. And one last thing - the garden would take all the garbage away by grabbing it so it would disappear and you wouldn't see it anymore. The imagination truly is a garden where anything is possible. What would grow in your garden? Do you have a favorite garden or spring themed picture book? Under the Green Willow - "The Making of My Garden"
The Almost Librarian - How does your garden grow? We tried making Reversible Accordion Fold Pictures this week for our stART (story+art) craft. 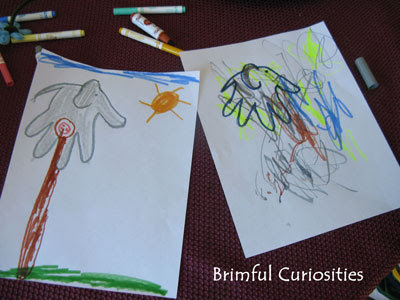 If you turn the paper one way, you see Mom's Garden and when you turn the paper the other way, you see the child's imaginary garden. This is one of those projects I should have prepared in advance, because I pushed the boundaries of my daughter's patience with too many folds. She didn't finish her project, but enjoyed making her garden change from all pink to many colors. Later on, I went back and made a simple design with only 5 folds (six total sides to color) instead of the seven we started with. 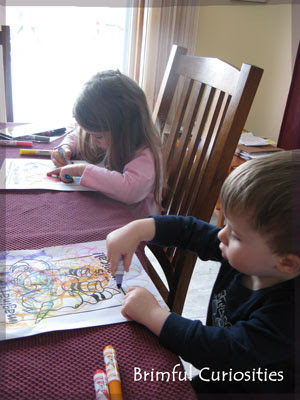 To begin, divide the 8-1/2 x 11 paper into 6 sections lengthwise and accordion fold 5 times. 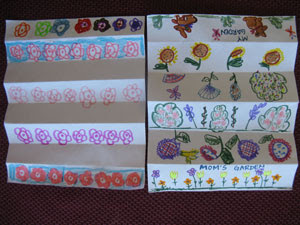 On alternating strips draw images for mom's garden and then for the child's imaginary garden. 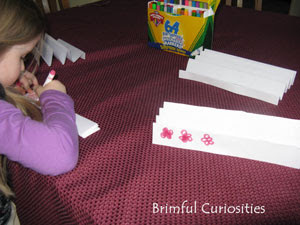 Position the paper to see mom's garden from one direction and the child's garden from the other. It's like magic! Thank goodness for markers. They allow mom a moment's peace every once and awhile. Especially needed when mom is sick. I've learned a sinus infection does not equal good times. The Chinese New Year began on February 14th, 2010, ushering in the Year of the Tiger. The celebrations are underway, and last week I noticed several blogs that mentioned Chinese New Year themed crafts and books in their posts. Last year my family attended a Chinese New Year celebration, but we missed this year's local events due to illness. My kids were looking forward to watching the lion dance again so they were disappointed we could not attend the festivities. To compensate for missing the event, we immersed ourselves in the Chinese language by reading several books from the Mandy and Pandy book series by Chris Lin. He created the series after he adopted his daughter, Mandy, from China and could not find fun, age appropriate books to teach her Chinese. The books teach young children (and their parents) simplified Mandarin Chinese by displaying English phrases along with the corresponding Chinese characters and also use pinyin phonetics to help with pronunciation. The small sized board books retail at $12.95 each and feature cute and colorful illustrations by Ingrid Villalta. 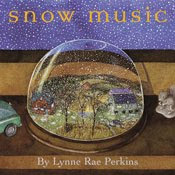 Each book includes an accompanying CD that helps readers learn through an auditory medium as they listen to the book read aloud. The book is read three times on the corresponding CD. First, Chris Lin, the author, reads the phrases in English followed by Jiao Jing, Mandy's Chinese teacher from China, who pronounces the characters in Chinese. Secondly, Jiao Jing says the characters in a teacher's tone. Finally, Jiao Jing reads the book in Chinese using a conversational tone. 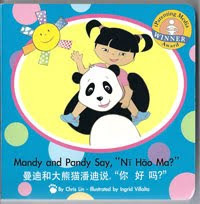 The first book in the series is Mandy and Pandy Say, "Ni Hao Ma?" This book introduces the main characters -- a little girl named Mandy and her panda friend, Pandy. They converse using short, basic phrases like, "Hi Mandy, how are you?" (màn dí, nǐ hǎo ma?) The book also includes terms like Mommy, Daddy, a few different foods, and sleep and good night. 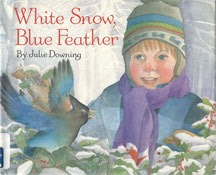 The characters talk about outdoor activities like visiting the park, swimming and playing in the snow. Quiet music plays in the background behind the narration. 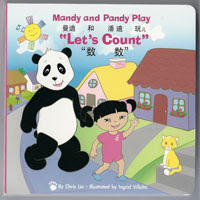 The second book, Mandy and Pandy Play "Let's Count" , helps children learn the numbers one through ten in Chinese. Mandy and Pandy use the numbers in short sentences to describe things they see while on a walk. For instance, the page discussing number nine reads, "Nine clouds...in the sky" (jiǔ duǒ bái yún...zài kōng zhōng, zài kōng zhōng.) A few pages in the back give a complete overview of all the numbers. My kids really like singing the song, "One little, two little...friends" on the last pages of the book. In the audio recording, the narrators use rhythm sticks to help with cadence and pronunciation. Chris Lin also provides a very brief description of the four tone marks used for the different Chinese sounds in this CD. Mandy and Pandy Visit China (book 3) is formatted a little differently than the first two. 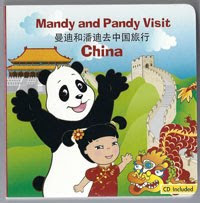 In this book, Mandy and Pandy speak to each other using complete sentences and discuss their flight and visit to China. Together they see the capital of China, Beijing, the walk along the Great Wall of China, view cities like Shanghai, Hong Kong, Xi'an and a mountain called Changbai. 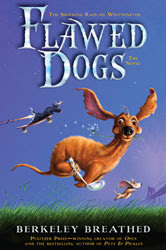 Four different people narrate the book, two men provide the voice for Pandy (Chris Lin and Jerry Xu) and two women provide the voice for Mandy (Michelle Shulman and Jiao Jing). Another book in the series is Mandy and Pandy Play Sports (Book 4). Corresponding with this year's Chinese New Year, two new titles were just released, Mandy and Pandy Play "What Colors Do You See?" (Book 5) and Mandy and Pandy Visit the Zoo (Book 6). China is an emerging country and there is an increased demand for Chinese education in places around the world. The Mandy and Pandy books provide a good basic introduction to the Chinese culture and their language for English speaking children. The adorable illustrations of Mandy and Pandy help engage young children and compliment the text. I especially like that the books don't just teach single words but put the words into context by using sentences and short phrases. My preschool-aged daughter liked the counting book best of all and really enjoyed singing along with the number song and learning the numbers. As soon as I put the CD from the first book into our player, my toddler son came running, shouting "Kai-Lan?" 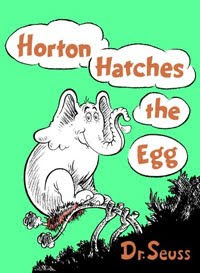 His only exposure to Chinese prior to this book series was from the popular Nick, Jr. show, and I found it impressive that he knew that the language being spoken was the same as that heard on the show. Early exposure is important in raising bilingual children, and TV shows like Kai-Lan and books such as the Mandy and Pandy series provide interactive and entertaining ways for young children to learn the Chinese language. While we enjoy the Kai-Lan shows, the Pandy and Mandy book series goes much farther in providing a solid introduction to the Chinese language because they provide English text along with the corresponding Chinese characters and spell out the sounds using pinyin. Most importantly, the audio CDs provide the correct pronunciations and tonal inflections and children are given time to repeat the sentences and phrases. I found the Mandy and Pandy website somewhat lacking. 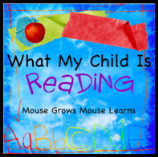 It would be helpful for me, as a parent, if the site included a brief introduction to the Chinese language, discussed the Chinese tones in more detail, and included printables and other activities to use along with the books. Hopefully, as the books gain popularity, the site will become more interactive. Besides in home use, the Mandy and Pandy books would work perfectly in teaching basic Chinese to preschoolers and early elementary students and for use in daycare settings. Ni Hao, Kai-Lan - Nick. Jr. 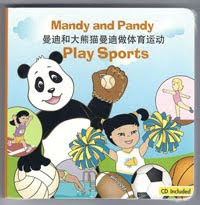 Celebrate sports and the Chinese New Year by entering for a chance to win a copy of book 4, Mandy and Pandy Play Sports . 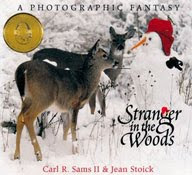 I have one copy of the children's book to give away to a Brimful Curiosities reader. To enter, leave a comment with a word or phrase you would like to learn how to say in Chinese. • Contest ends on Monday, March 8th, 2010 at 11:59 PM CST. Baby showers are filled with smiles and excitement. I had such fun at my own showers, and it's hard to believe they took place nearly five years ago. My friends and family planned two separate baby showers for me before my daughter was born. We brought home so many wonderful gifts. My husband and I enjoyed registering for all the baby gifts even more than our wedding gifts. All the little cute clothes and products--it's a world of babies, baths, books and bedtimes and absolutely nothing can prepare you for the exciting and exhausting times ahead. 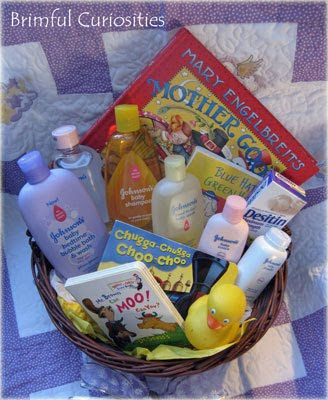 One of my favorite gifts to give when I attend a baby shower is what I call a bath and bedtime basket. I usually fill a basket or bag with some Johnson's baby products, a rubber ducky, washcloths and, of course, plenty of children's books. I wrap the basket with a baby blanket and tie a bow on top. A new mother can never receive too many bath products or too many books! I received three bottles of Johnson's head-to-toe baby wash for my own shower and still use the product every night for my son. 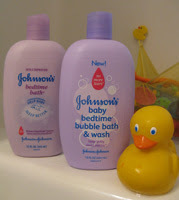 A few years ago, we started using Johnson's bedtime bath (the one in the purple bottle) for my daughter. It has a wonderful, soothing aroma, the no more tears formula and includes NATURALCALM™ essences that, according to the manufacturer, helps the child fall asleep easier at night. But, I absolutely love the scent and would use the product for that reason alone. Just recently Johnson's came out with a new combination bubble bath and wash. We had the chance to try out the baby bedtime bubble bath & wash in the purple bottle. The aroma is slightly less strong than the normal bedtime bath and smells a little more like bubble bath. As expected, when used in the bath it does generate bigger and more numerous bubbles for the kids than the normal bedtime bath product and it lathers a little more. My daughter likes the idea of using bubble bath and prefers the bottle design with all the bubble graphics. I think we'll use the product occasionally when the kids want a few more bubbles in the tub and use the normal bedtime bath for everyday use. The johnsonsbaby.com website includes several printable coupons for their products, other informative guides and even downloadable lullabies. It's definitely worth a visit if you use Johnson's products regularly or plan to pick up a few gifts for an upcoming baby shower. Next week, Tuesday, February 23rd from 3-4 pm EST Mom Central is hosting a Johnson's Baby Shower Twitter Party. Talk about favorite baby shower gifts, Johnson's Baby products to gift at showers, and other tips and tricks for new Moms. They will give away Johnson's products and prizes! Use the hashtag #MCBabyShower and join the virtual shower. 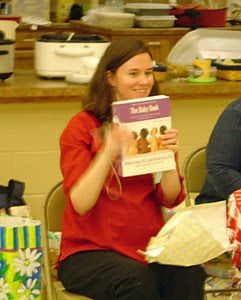 What kind of gifts do you give at baby showers? 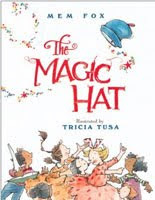 Some of my favorite books to give include Mary Engelbreit's Mother Goose, Blue Hat, Green Hat by Sandra Boynton, any of the Bright and Early Board Books and Chugga Chugga Choo Choo by Kevin Lewis. One of the favorite books I received at my shower is The Baby Book: Everything You Need to Know About Your Baby from Birth to Age Two by William Sears, Martha Sears. I'm pictured to the left opening that gift at my shower and have referenced it often. I wrote this review while participating in a blog tour campaign by Mom Central on behalf of Johnson’s and received samples of Johnson’s Baby products to facilitate my review. View my full disclosure statement for more information about my reviews. 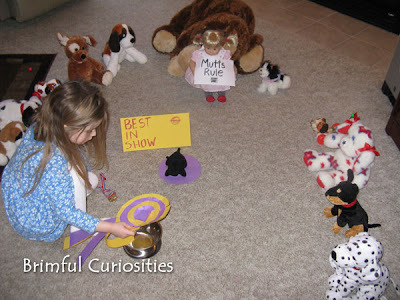 We conducted our own Westminster Dog Show, and the Scottish terrier won Best in Show. The show was interrupted by a protester holding a sign that said, "Mutts Rule." 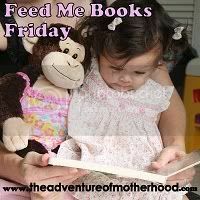 Feed Me Books Friday is all about LOVE this week. Here are a few of our favorite love themed books, just in time for Valentine's Day. If you have time, visit The Adventure of Motherhood to link up your favorites. My toddler son loves to cuddle and give kisses. I don't know how long that will last, but I'm sure enjoying his displays of affection. He is my little love bug, and he adores the book You're My Little Love Bug by Heidi R. Weimer, mostly because of the flashy lights and music. 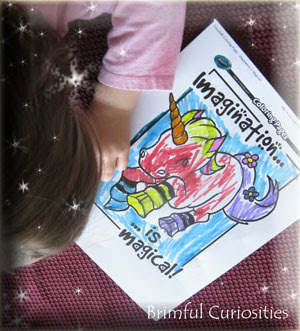 The book consists of rhyming, cutesy endearments and whimsical illustrations. It is super sugary sweet so watch out if you're usually not one to go overboard with the sweetie phrases. It's one of those "small batteries required" books...just warning you. The music from the book doesn't quite match up to the text so you have to either make your story shorter or close and reopen the book to finish singing along. The last phrase is the best, "You're everything that's wonderful/You're all of the above!/But most of all/What you are/Is God's sweetest gift of love!" My preschool daughter checked out several Valentine's Day themed books from the library. Her favorite is Roses Are Pink, Your Feet Really Stink by Diane deGroat. A furry animal named Gilbert needs to write out Valentine's Day poems for his classmates but doesn't feel like being nice towards Lewis and Margaret. Earlier they made fun of him so he retaliates by writing nasty poems and making it sound like Margaret and Lewis sent them to each other. 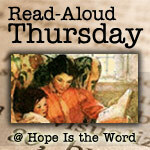 The book stimulates discussion about classroom dynamics, friendships, apologies and forgiveness. I especially like that the children solve their own problems. One of the girls in the class asks Gilbert why he did such a mean thing and mends hurt feelings. 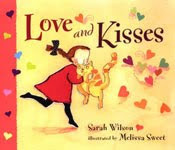 A short and sweet book I really like is Love and Kisses by Sarah Wilson. It's a kissing pay-it-forward book that shows that love does really come back around and grows. The book pairs perfectly with the song, "Love Grows One By One." And comes back knocking at your front door. Color Me Katie has a super cute Kiss in Your Pocket Valentine's Day gift idea that you should check out. 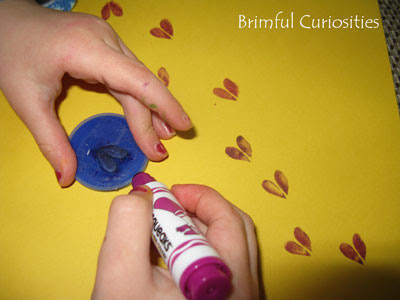 Perfect corresponding craft activity for the Love and Kisses book.